Here are a couple of worthwhile vids about living well. I’ve been thinking about this sort of thing recently: live like a king, die without a penny. The federal government is devaluing the currency (just wait until the “stimulus” gets turned into ten times that amount in debt! I hope they find that the public isn’t buying it) perhaps faster than what you can earn in interest. What if traditional retirement (ie save up enough to live on the interest) won’t work in the future? Just something that’s been percolating for me. One plan I’m considering is simply not accumulating any assets, only perhaps some use-able commodities. What else can have value but not be considered an asset? What cannot be looted by lawyers or the IRS? Goodwill with a local farmer? A skill that can be turned into cash easily (bike repairman)? Loyal children with good jobs? There’s your social security. Is there a commodity that has a shelf-life of 20+ years that can be both consumed, sold or traded with relative ease? Deodorant, Soap, Propane? Right now I have a negative net worth. A bum walking down the road who picks up a $0.05 can and puts it in his bag is richer than me. His net worth is “positive one nickel”. If you want to be really paranoid, and about something that will probably happen before the US collapses under it’s debt… start looking into what peak oilers are saying: Cheap credit depends on cheap energy. Our culture is dependent on cheap energy. Cheap energy is a thing of the past. Enjoying the site and the videos… I’ll be a customer as soon as my own personal debt is paid off! I really appreciate feedback on the blog. I am open to differing viewpoints. I would like to air various sides of an issue. If what I write is unfounded, then let’s hear why. The only thing I would take mild issue with is the use of the work “paranoid”. That means that someone is imagining danger when there is none: an unreasonable fear. I maintain that my concerns are well-founded, and if anything, the majority of Americans are suffering from the opposite of paranoia: there are dangers that are not being recognized. This is not tin-foil-hat-conspiracy-theory. It’s everyday stuff that profoundly affects the well-being of common citizens. Don’t drink the water from the pool the Banks have created. It is poison. It will hurt you. You don’t need their “products” (so-called). There is a better and healthier way. This from the guy who likes Twinkies! But you get my point. My sincere hope is that some readers will start looking at things differently. Through my experience as a business owner my life view has changed. I have felt the heavy hand of government. That they can destroy a small business or destroy someone’s life, liberty and property is not some imagined threat. It is real. It has already happened to me. I managed to survive. But now that the sharks have ripped off one of my feet, I am much more careful as I swim in the water nowadays. What hurts small business hurts the workers. That really bothers me. Through this experience I started to read more and more on politics. Then I dug down to a layer where it was clear that I had to read more about economics and banking. I’m no expert. The more I read, the less informed I feel. However, the study of it has given me ideas for my business, and helped me to understand how things work. I no longer wish to trade glass beads for my life essence. I once read a book called “The Religion Worth Having”. The thesis of the book was that there is a way-the-universe-actually-is and that the more that a religion, or an individual, or a society conformed to the actual and real laws of that universe the more successful it would be. A ship can’t vote it’s way around the Strait of Magellan. It must have accurate maps and follow sound nautical principles. I think the founding fathers referred to this as “natural law”. That’s sort of a blank area for me right now. 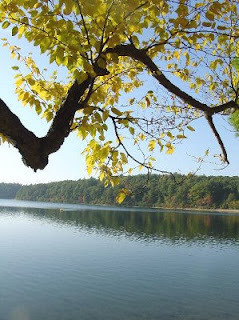 PS- some have noticed that I have comments turned off on my blog. I prefer to have people email me comments and then to post them. During this last six months I have had “moments of bliss” with increasing frequency. It’s usually when I’m driving home. There is a broad lane through a residential area (this harkens back to pioneer days when Brigham Young proclaimed streets wide enough to turn around a yoke of eight horses… something like that) that runs southwards, and as the avenue slopes upwards there are broad green clouds of trees, and between them towering mountains. Now that summer is coming they have a white filigree crown of receding snow, and from the base are long encroaching fingers of greenery. Sometimes the clouds appear as vast fields of bulbous white and pink jade. It looks like a picture. But it’s real. I know that soon I will be with my wife and children in my hobbit hole. And my heart swells with gratitude and well-being. Today I was up at 6:00am and started in on the correspondence. I went back to sleep for a cat nap later in the morning. Then around 11am off to a barbecue at the Barrowes. Good eats and good company. My wife made her tried and true succotash. I had some of that, a hamburger (with guac), rice krispie treats, and a brownie all washed down with ice cold lemonade. The Barrowes have had a couple of daughters get married this last year. It’s really something to see two families come together. And then the grand-kids. After that I headed to the studio by my lonesomes to keep a lid on the various processes. By and by a friend of mine (who you know as Sky Marshall Anonymo) showed up with his Warriors of Chaos army to play a game of Warhammer Fantasy with me. I played a client’s High Elf army (which I was given explicit permission to do). I will have a Notrep up for that later this week. It took us about seven hours to finally work around to the end of the battle. His wife came by with Taco Bell dinner. Good stuff. He also brought his HD recording device and we shot a few videos for Hordes. I am over 90% done with the Skorne army. It’s looking really good. Just heard on www.40kradio.com that the Land Speeder Storm (being released in about a month?) will have the land speeder and five scouts for $30. I’d snap a bunch of those up before they jack up the price. PS- the Hero of the Imperium special still has one slot open. I am currently booking projects for August as well. I am standing by. I am available for any matter. PPS- Those interested in the progress of the Pandora’s Army special will be pleased to hear that all materials have been ordered. We are doing the following armies: Deathguard, Tau, Imperial Guard, and Wood Elves. The Pandora’s Army special is closed now. I plan on reincarnating it later in July, smoother and stronger. Here’s a new one. This is a limited offer; two slots. You get a $10,000 credit (yes, ten thousand) to be used for painted/finished figures for $5500. Once you pay, the credit becomes available by by degree each month, starting with the first day after you pay, at the rate of minimum $1000 per month. Or a $5,000 credit for $3,000. It’s the ultimate bulk deal. I personally guarantee to uphold my end of the bargain. I give you my word to act in good faith. No shenanigans. You get free shipping for your projects. During the course of the five to ten months we will make at least five videos related to your projects or dedicated/useful to you somehow. You get two shots of free shipping for Forge World stuff (we will cover for shipping, but you cover models). Multiple people can get together for one of these, but there needs to be a spokesperson. The other people can get credited whatever the agreed amount is, but I need to deal with just one person. So, if Fred Jones is the spokesperson for the group, he passes along Instructions and sets things up by proxy, and tells me shipping addresses. However, if Fred skips town, other people involved retain their credits as long as this is A) set up beforehand (ie it’s agreed who gets what and when), and B) they contact me before the models are shipped. Best to just make sure Fred is someone of impeccable character. For example: a consortium of four people could go in at $1375 each and each get a $2500 credit. Every two or three months one of them would be in line to get a substantial army done (or however you want to split it). There are a few conditions. The credit is can be used for materials (ie the models/kits) but those need to be assembled and painted by BTP as part of the deal (ie you can’t just have us mail you kits). If you are dis-satisfied in any way, you agree to notify us and let us make reasonable amends. This deal is subject to our normal Terms of Service in our service guide. The normal discounts for materials are not cumulative with this credit. You pay 100%. BUT (for those that are doing the math) you get an even better discount of effectively 45% on your materials (because you paid 55 cents on the dollar for your credit). In other words you will be getting $100 worth of kit for every $55 you paid. 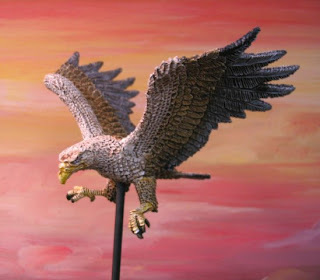 You can also send your own models to be painted. You don’t need to get them through BTP. The credit can only be used for commonly available materials (for example: not Forge World). This special is the best deal offered to date. It is not cumulative with other specials. Exceptions: L2, Tank Factory, and Artistic License (those specials are cumulative with this one). Other specials/deals or whatever work with this one only at BTP’s discretion. BTP can reasonably clarify or amend unclear areas of the deal. There are always little gremlins that get in works. We both agree to be reasonable. PS- I almost called this the “Army of the Month” special! When you asked if I wanted plague marines or Tau you noted that Plague marines are a tough tourney army. 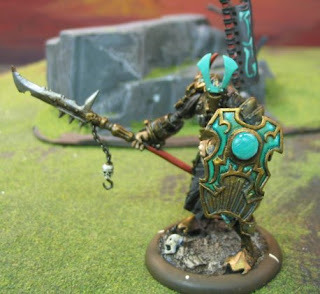 I wanted to say that I agree, but that I also think Tau could be a very viable tourney army and I think the hobby itself is more fun when lots of different races and builds are played. I know from comments on your blog that you likewise are saddened but the advent of cookie cutter builds and certainly enjoyed reading your lament of the 6- and 7-wide movement trays that became so popular. I should note that I have no issues with tough lists, just unoriginal ones. 1. They insist on running with loads of firewarriors as their troop base instead of kroot. Firewarriors are really NOT good. At range firewarriors do ok, but once folks start closing they must embark the devilfish and move away or die. 2. 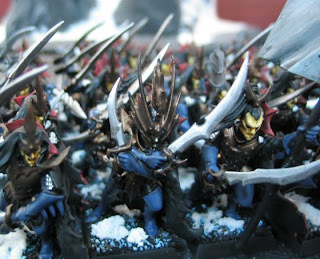 They forget to add in a bunch of kroot hounds (the punch in the list) to the kroot. I think this is largely because the models aren’t particularly sweet and being metal, are so expensive. Having said that, it’s NO excuse as there are SO many other alternatives (WFB chaos wolves, flesh hounds of Khorne [just as expensive but better looking], the wolves from Goblin Wolf riders (don’t know if this would work as I’ve never seen the set), Vampire Count Dire wolves [i’m sure some theme could work], heck maybe even get creative with a box of tyranids). 3. They equip their battlesuits with fusion and flamers following the thought that melta and template are 5e essentials for SM, CSM, IG, Eldar etc… This takes the battlesuit away from its core competency – long range death with a move that allows you to constantly stay out of range of basic infantry. JSJ allows you to essentially move 12″ while firing. Since every battlesuit you buy will generally have a misslepod, there should be no transports either. 4. They overload on stealth suits (cause they look cool) without realizing that battlesuits can generally do it better and cheaper (except markerlights). 5. They buy stealth suits to use as markerlight carriers without realizing that pathfinders can do it better and cheaper (plus you can use the devilfish for your fire warriors). 6. 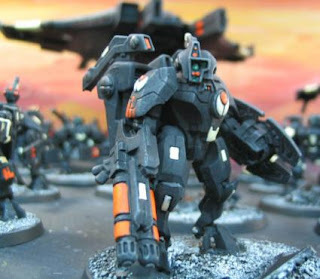 Adding stealth suits takes elite spots (the firepower of the tau) and keeps you from having full complement of battlesuits. i think you want 1-3 fireknife groups (plasma, missle and multi-tracker), 0-2 deathrain groups (twin linked missle pods with either target array or flamer), and 0-2 firestorm (burstcannon, plasma, and mult-tracker). I think commander(s) should always be fireknife (I hear airbursting frag is pretty decent too though, maybe with a misslepod…). Fireknife eat marines, terminators, transports and characters. Deathrain = transport death, Firestorm = death to infantry. 7. 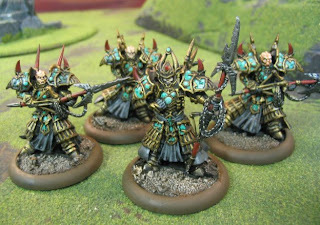 They use vespids because they were cool in Dawn of War even though they could be the most useless unit outside of Necron Pariahs. Today we played our first game of Hordes. Renn’s Trollbloods vs Brigh’s Orboros “Solid Stone” force. I didn’t record it mostly on account of some unpainted figures (I wouldn’t want your delicate eyes being sullied by white primer). Brigh’s army is a tough nut to crack and I think the learning curve is steep. We all learned a lot about how the game is played. Hordes is more like a game of gladiatorial combat than a wargame of battlefield tactics. It’s very rich and complex. I plan on doing some how-to videos. For my part I managed to paint a unit of Ferox Riders (guys on sabre-tooth tigers), a Cyclops Shaman and a Basilisk Krea. I am holding off on pictures until the entire force is done, 858 points in total. I painted the Krea a lime-green which really makes it look like a toad. Is that a bad thing? Well, I like it. The typical game of Hordes is played at 750 pts. That’s like a 2000 point game of Warhammer. Got the spreadsheets uploaded for Hordes, too. The essential part that I’m trying to verify is if the “reserve” is a portion of the total deposits (what we’re taught in “It’s a Wonderful Life” and what most people believe), or if the “reserve” is the base amount of the deposit and the remainder is conjured out of thin air. Naturally, if the latter is true, then there is a great motivation to keep that under wraps and perpetuate the former idea in the minds of the masses. Yesterday I headed off to the studio around 11am after a breakfast of biscuits and gravy. For the last few weeks there has been a logjam in Assembly and that is just now working through. And then a logjam in Painting, but today the projects were flying off the shelves. Everything lined up perfectly. I spent the afternoon working on the Skorne project. Wednesday is the trial run and I need to have at least 500 points worked up. I’m booking projects for late July and early August. Best to get started early. There is still one golden spot open for the Pandora’s Army special. I am working to see how that can be a permanent fixture; there has been a positive response from all parties. The studio Redjaw Orks and Oceanic Eldar are both on the block, $1900 each. They are 2200-2400 pts apiece. I plan on creating a Stompa and Scorpion Grav Tank respectively for each which will be a separate deal. This price is a limited time offer, I will probably take them off the block sometime in the near future. Email me at bluetablepainting@gmail.com for details. Here are some of the Skorne I’ve painted up so far. Point-wise it’s about half-way through. Um, but really not truly half-way, just trying to keep my steam up. 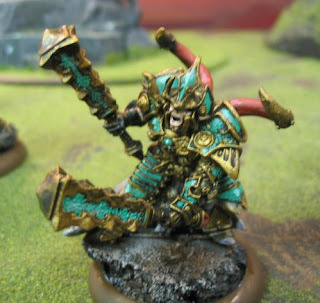 The tradition Skorne colors are brass and red (sound familiar?). But I decided to go with this green-turquoise color. I think it’s working. After I take pics I see all sorts of flaws that need to be smoothed out. Things not visible in person. It’s really unfair. The bases still need some grass on them, too. Hey all. Here is how to set up a commission. I have updated this. Notably, I got rid of the old Tank Factory special and replaced it with the “get one painted, get another painted free” type special from recent months (minimum three pairs = six vehicles). That one is a better deal and more accessible. Also note the Trade-in deal also allows you the option to just get regular kits (not assembled or painted) shipped to you, as well as getting your models assembled/painted. See below for details. As a general rule of thumb it costs $500-1200 per 1000 points in an army. This is if we provide everything (models, assembly, and painting). This varies based on a number of factors, mostly the quality of painting you choose. If you just want painting only (ie you have your models already assembled) the cost is about half of that. Attached is a spreadsheet outlining all costs of your project. Or you can download a generic sheet for your army here. Here is a video on how to use the spreadsheet. You do not have to fill this out yourself. I will be happy to work from an emailed list. A) Fill out the sheet yourself This spreadsheet will auto-calculate all costs associated with your commission. If you are providing and/or assembling your own models you will naturally zero out those totals. B) Send a list of what you’d like done. What models need assembly? Cleaning? What models are you providing? What models would you like us to provide? I’ll send back a detailed quote. C) Call me and I will set everything up over the phone with you. 801 372 8545. We have several specials available. Only one can be applied. 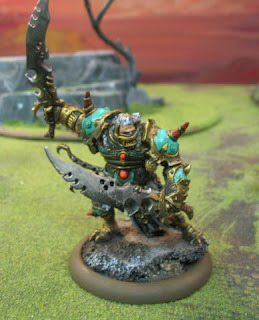 1) Level 2—models can be given a basic paint job. Save 30% off painting. 2) Artistic License—we decide completely how a project is painted and based. Save 10% on painting. 4) Tank Factory—Get three tanks painted and get three painted free. See below for details. 5) Tradein—trade in your current range (in print) kits and models as part of your payment. This can be combined with other specials. Details below. This project will be scheduled officially for completion in 25-35 days. If you need your project for an event (like a tournament), please make that known, we can often accommodate that. I would recommend that you look over our Service Guide . Generally speaking, Levels 2-4 are reserved for whole units of models or vehicles/monsters. Levels 5-6 are for individual hero types. Also keep up to date with our Daily Blog: http://www.bluetablepainting.blogspot.com/ I keep that updated almost daily. I’d be interested to know how you heard of Blue Table. PS- if you have any problem with the spreadsheet, just let me know—I can send the quote as in-line text. Here are the details– they must be in pairs. There must be at least three pairs (six vehicles). You can’t have a two chimeras painted regular price and then get two baneblades done for free. But you could have a chimera and a baneblade done then get two more of the same done free. Tanks don’t need to be the exact same to count as a pair, just similar (so you could pair up a Hellhound and a Chimera). All the vehicles in a project need to be roughly the same color scheme. Doesn’t apply to Forge World. Must ask for the special by name before the project is underway. Normal assembly rates apply. Here are the trade-in rates for Spring/Summer 2009. I’m offering service credit in trade for models (you can also get kits, see below). Read this completely as I have recently improved almost every aspect of this program! . You can usually get a much better deal going to the secondary market (local shop, ebay) on your own. However, the advantage of trading in with us is that you are likely to be able to unload disparate items without a lot of hassle (e.g. finding various buyers, setting up payment, lots of minor questions). . If you want to trade in, we need a list with retail values and condition (e.g. new in box, new on sprue, assembled, primed). The rates below are a multiplier. If the entry says 0.30 it means you would get $30 for $100 worth of retail items. Just take the retail total and multiply it by the number. You do not need to figure this out; you can just send in your list of stuff to bluetablepainting@gmail.com . In the past I have only allowed for half or less of a project to be paid in credit this way. But for the time being I am lifting that restriction. . I just know there’s someone who goes out to their garage, surveys the mass of unpainted models, sighs then turns out the light. This program will hopefully allow someone with the “white primer horde” to finally show up with a painted army. As an added bonus, your models will get a good home where they will be painted and loved. .
We don’t need painted figures. Exception: if they only have a little bit done with them; not too thick, not too many layers. Primed models are OK, again not too thick. .
You can also get a credit of at least $10 to help with your shipping costs. This is on request. . If you want to trade-in figures, but don’t have a project ready, that’s OK, I will confirm your total and then you will have it on tap for when you want to use it. . This trade-in is recorded as a payment on your project. It is non-refundable except at our discretion (eg you can’t refuse the project and then get your trade-in amount refunded as cash). 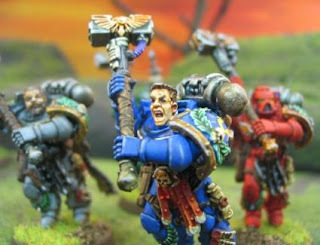 Trade-in can be applied to cost of models, assembly or painting as you wish. This means you can also just get models sent to you (this is limited to models that are commonly available, eg not Forge World)..
Generally, we only need in-print models that are currently in production. . These rates and conditions may change so it is recommended to check in every once in a while. I am likely to update the numbers about once a month. The plan right now is to update every first of the month. Fairness is the guiding principle. .